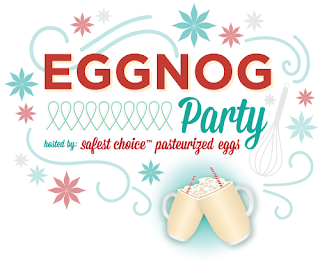 I'm happy to be participating in an Eggnog Party sponsored by Davidson's Safest Choice® Eggs. They've asked me to create and post an eggnog recipe using their pasteurized eggs. The giveaway will end at midnight Eastern time on Friday, December 13th. You can enter at the end of this post. So, why use pasteurized eggs? "Davidson’s Safest Choice® Eggs are pasteurized in an all-natural, gentle water bath pasteurization process to eliminate the risk of Salmonella. The vast majority of eggs sold in grocery stores are NOT pasteurized. Safest Choice™ offers peace of mind when making recipes calling for raw or undercooked eggs [like homemade eggnog] and removes the worry of cross contamination." In a small bowl, combine flour, baking powder, nutmeg, & salt. Set aside. In the bowl of a stand mixer, beat the sugar and butter until light and fluffily. On medium speed, add the eggs, one at a time, beating until blended. Add one third of the flour mixture, beating on low speed just until combined. Beat in half of the eggnog. Add another one third of the flour mixture, the remaining eggnog, and then the remaining flour mixture, beating after each addition just until combined. Gently stir in the cranberries and walnuts. Pour into a buttered/floured loaf pan. To make the glaze: mix powdered sugar & eggnog until smooth. Drizzle over the cooled cake. 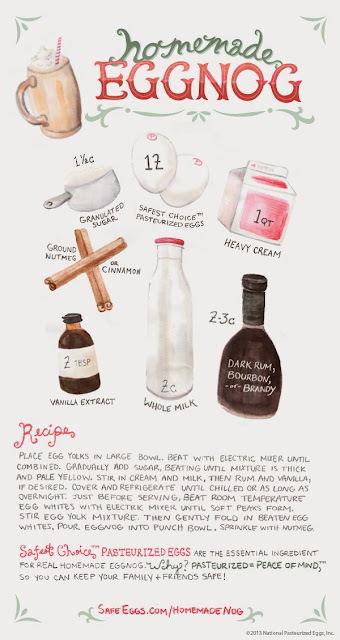 Check out more eggnog recipes HERE. You had me at "rum-soaked cranberries!"